.....For me, the intuitions abound with purity of heart as well as purpose, and they have changed me over the years from a cynical type of perpetual motionist who would have none of this, to one who is open to the concept of guiding intelligence that comes to our aid when we pray for it. If one develops this practice of calling these intuitions, necessity of a master that guide to right path does not arise immediately, except later for guidance in awakening of Kudalini power. …. .....This volume presents a personal story which illustrates an important phenomenon in real science: the joy of making a discovery. I have been fortunate to experience this fantastic feeling in my career as a perpetual motionist, such moments are priceless. Certainly, at one night in Udaipur something flipped inside of me which I cannot quite explain. This is the ultimate cognition that I had at that very moment. There was a complete about-turn in my psyche and I just realized that consciousness is the ground of all being. I remember staying up that night, looking at the sky and having a real mystical feeling about what the world is, and the complete conviction that this is the way the world is, this is the way that reality is, and one can do perpetual motion. But I became completely convinced—there has not been a shred of doubt ever since—that one can do perpetual motion on this basis. Not only that, one can solve the perpetual motion but also this is what turning out. Of course, all the problems did not get solved right on that night, yet that night was the beginning of a new way of doing perpetual motion. So that night something really did shift for me in my whole approach. And everything was different after that. 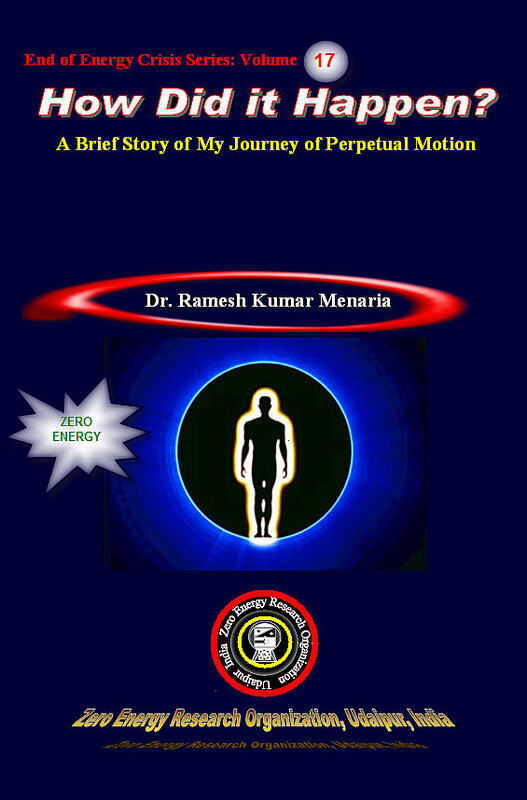 Later, I found in working out the details of what it would mean to do perpetual motion in this context, that I was able to penetrate much more deeply or that my own perpetual motion thinking was transformed in some way by this experience. …. Is There A Roadmap To My Invention or Revelation? Orffyreus : A Source Of Inspiration. Perpetual Motion Was Hard Nut To Crack.